OK, I saw these on Annie’s Eats and made them last summer and they were to DIE for! I don’t think I’ll ever make another brownie again. yum! Wow, thank you for the recipe! 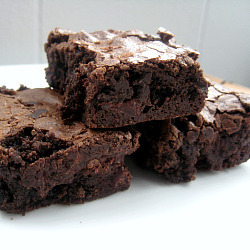 The one attempt I had of homemade brownies did not go so well, but the picture for these ones looks so delicious. 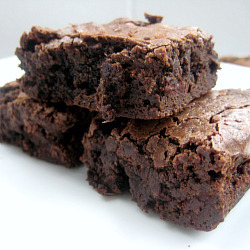 I’m definitely bookmarking this recipe for the next time I want to try brownies- thanks! I love to make and eat brownies! I haven’t tried this recipe yet. I am bookmarking it. Your brownies look great! i’ve been dying to try this recipe! they look fabulous! 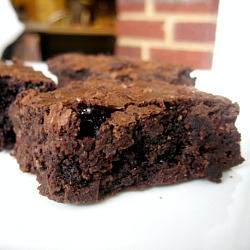 Just curious – Cooks Illustrated latest brownie recipe (March 2010) is different from this one. Do you prefer this recipe to that one? I have not tired the March 2010 recipe so I can’t compare the two! This recipe is wonderful though! OH MY. I did a search for peach cobbler and came upon your site. THEN I came across these brownies!!!! Thanks for sharing! I made these last night and they were super easy and simply delish! They turned out fudgey like you said! Although I prefer a mix of both fudgey and cakey brownies, these where really good! Thanks! I also found this recipe on Foodgawker.com! I love it!